On November 9th, 1970, Janett Schusky was flying on an Ethiopian Airlines ‘fanjet’ plane (Probably a Boeing 720) when it collided with a natural feature: the Equator. Impacting this line, 90° off the rotational axis of the planet Earth, caused damage to neither passengers nor craft, but Schusky’s survival entitled her to the title “Aviaticus Solaris Empyrus“, seemingly a jumble of important-sounding Latin words that may translate to something along the lines of “Flyer to the Heaven of the Sun.” Ethiopia’s famine and troubles during the 80s and 90s may make it seem backward and aboriginal, but they’ve been operating an airline as long as many European countries. 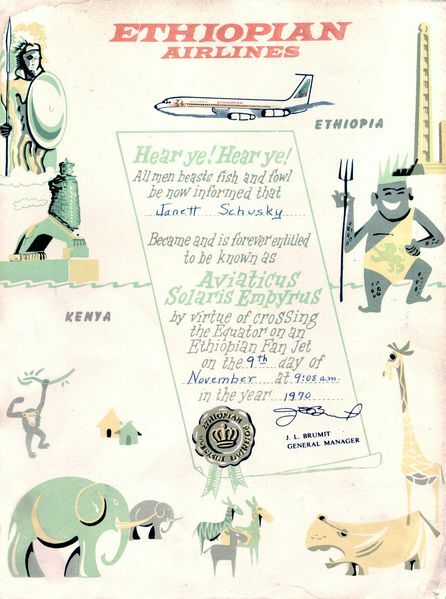 Unlike last week’s TWA certificate, which promotes air travel as a worldly benefit, Air Ethiopia’s certificate here seems to promote Ethiopia’s connection to the rest of the world, despite having to cross the Equator to get there. This entry was posted on Tuesday, February 26th, 2008 at 8:06 am	and is filed under Uncategorized. You can follow any responses to this entry through the RSS 2.0 feed. You can leave a response, or trackback from your own site.